Our business has grown and evolved over the last 20 years from custom web application development to our current position as a key player in the Digital Asset Management (DAM) space, thanks to the success of our flagship software product Asset Bank. We feel that now is the right time to relaunch our brand and update our brand identity to reflect who we are today and to symbolise our dynamic future. Even though our company name has always been Bright Interactive, over the past 14 years we have primarily focused on Asset Bank. We’ve worked hard to build Asset Bank’s reputation in the DAM industry over this period and we are now proud to be positioned as a market leader with some great awards under our belt. This is all thanks to the dedication shown by our team from those in development, business operations and sales and marketing to our fantastic customer support and on-boarding team who look after over 800 clients worldwide. As a result of this success, our Asset Bank brand name began to gain more recognition than our company name; Bright Interactive, and this started to cause confusion both internally and for our customers. Our growth started to feel restricted and our plans to launch and market new DAM products alongside Asset Bank became a real challenge, as we had no clear architecture for branding and naming conventions. As a result, we knew we had to make a change to our name and create a brand architecture that would help us flourish without restriction. We’re now delighted to announce that we are ready to launch two new products which will join the Asset Bank suite; Dash and Brand Hub. The launch of these two new products has directly influenced our decision to create a clear brand architecture which will support the growth of our brand and give us more flexibility in future. After much review of potential names for the brand, we realised that Bright was not only a symbol of who we were when we began, it also described our future. It felt foolish to discount it - but we’d definitely outgrown our current brand design and logo. We went ahead and shortened Bright Interactive to Bright and adopted this as our master brand name. With Bright now as the master brand, we were able to create an architecture for all of our Bright products - Asset Bank, Dash and Brand Hub. Now that we’d settled on our new master brand name we needed a new company logo that reflected our core values, who we are and what we stand for. We wanted to represent our products and our people through our logo and stand out from an already crowded marketplace. It was important for us to show that whilst we build products that help our customers manage their digital files, we’re also committed to helping people to be more productive and fulfilled at work. So, after months of creative work and brainstorming, the design we agreed on has been created to communicate more effectively who we are. We realised that a bright logo required a bright idea and our logo is carefully designed to signify individuality and intelligence. The fingerprint symbolises the individual. This is reflected in the unique, personal and human way in which we support our clients. We treat our clients as individuals, taking a unique approach to each client case and offering tailored solutions and support for their needs. It also symbolises our teams internally and our approach to individuality and diversity. The brain represents the intelligence behind everything we do and how we do it for our clients and how we create products. The Bright logo is our brand icon and it is carefully designed as an abstract combination of the fingerprint and the brain symbol. To match the look and feel of our mother brand, our flagship product Asset Bank has also received an overhaul and gone are the blue and green folders. Instead, we have a simplified product logo which mimics the simplicity and soft curves of our Bright logo. By making this change it gives us more flexibility to create additional products with similar branding and that clearly sit under the same umbrella brand. Colour provides a strong and visual link to a company’s brand identity across a wide range of applications and the consistent representation of these colours will help reinforce the distinctiveness of our Bright brand. The Bright violet colour we use stand for leadership, dignity, truth, maturity, longevity, discovery, understanding, clarity and empathy. 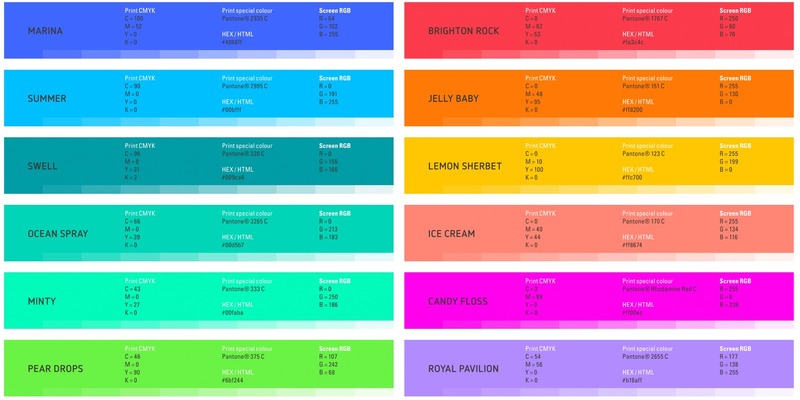 We also have an exciting array of bright accent colours to bring more life and brightness into our brand and which we feel really compliment our main colour with a bit of fun and excitement added. A new set of Brand Guidelines has been created and can be found here. Along with the new brand we needed to update our website and required a more flexible CMS to support our future growth. We decided to move our CMS to HubSpot and partnered with an agency to create our new website. It has taken us a few months to get here but we are really excited to share our new brand and website with the world! A big thank you to the extremely talented Gary at Propella and his design team for working with us on creating our new brand and architecture and putting up with our hundred changes, the fabulous team at Red-Fern for our website creation, implementation and strategy, for their patience, and last but not least, to all the amazing people here at Bright for working with us, supporting us and providing feedback and ideas when we were stuck and to help us move forward in the best way possible. It has been a challenging but highly rewarding last few months and together we finally got there and we could not be prouder of our new brand!